THE FORTRESS OF ST. PETER AND ST. PAUL. No Autocracy can be imagined without its Tower or its Bastille. The St. Petersburg Autocracy is no exception to the rule, and it has its Bastille in the Petropavlovskaya Fortress. This fortress, unlike the Bastille of Paris, has nothing particularly gloomy in its outer aspect, nothing striking. Its low granite bastions facing the Neva have a modern appearance; it contains the Mint, a cathedral where the Emperors and their families are buried, several buildings occupied by engineers and military, extensive arsenals in the new Cronwerk in the north; and the ordinary street traffic passes through it in the day-time. But a sensation of horror is felt by the inhabitants of St. Petersburg as they perceive on the other side of the Neva, opposite the Imperial palace, the grey bastions of the fortress; and gloomy are their thoughts as the northern wind brings across the river the discordant sound of the fortress-bells which every hour ring their melancholy tune. Tradition associates the sight and the name of the fortress with suffering and oppressions. Thousands--nay, scores of thousands of people, chiefly Little Russians, died there, as they laid the foundations of the bastions on the low, marshy island of Jani-saari. No remembrance of glorious defence is associated with it; nothing but memories of suffering indicted upon the foes of Autocracy. It was there that Peter I. tortured and mutilated the enemies of the Imperial rule which he tried to force upon Russia. There be ordered the death of his son Alexis--if he did not kill him with his own hands, as some historians say. There, too, during the reign of the Empresses, the omnipotent courtiers sent their personal rivals, leaving it an open questtion in so many families whether their relatives had been drowned in the Neva or remained buried alive in some stone cellar. There the heroes of the first and only attempt at revolution in St. Petersburg, the Decembrists, were confined some of them, like Batenkoff, remaining there for twelve whole years. There Karakozoff was tortured and hanged--almost a corpse, hardly showing any signs of life when he was brought to the scaffold. And since that time a whole generation of men and women, inspired with love for their oppressed people, and with ideas of liberty filtrating in from the West; or nursed by old popular traditions, have been detained there, some of them disappearing within the fortress for ever, others ending their life on its glacis, or within its walls, on the gallows; while hundreds have left those mute walls for secret transportation to the confines of the snow-deserts of Siberia--a whole generation in which the hopes of literary and scientific Russia were bound up--suppressed, annihilated, for no purpose! How many are in the fortress still? What is the lonely, disheartening existence they still drag out there? What will become of them? .... Nobody can answer these questions; and a kind of superstitious fear attaches itself to the huge mass of stone-work over which the Imperial banner floats. It is the Bastille--the last stronghold of Autocracy. There is a lofty three-storied building, which once obtained the nickname of "St. Petersburg Imperial University," because hundreds of students were marched there, between two files of bayonets, after the disorders at the University in 1861. Scores of young men were kept there for months before they were transported to "more or less remote provinces of the Empire," and saw their scientific career destroyed for ever by this "measure of the Emperor's clemency." There is again the Courtine of Catherine which faces the Neva, under whose wide embrasures graceful flowering bushes grow at the foot of the granite walls, between two bastions. It is there that Tchernyshevsky wrote in 1864 his remarkable novel "What is to be done?" which is just now stirring the hearts of the Socialist youth of America, and in Russia made a revolution in the relations of the students and the women who were striving for their right to knowledge. From the depth of a casemate in the Courtine, Tchernyshevsky taught the young men to see in woman a comrade and a friend--not a domestic slave--and his lesson has borne its fruits. It was there again that, a few years later, Dmitri Pissareff was imprisoned for having taken up the same noble work. Compelled to abandon it in the fortress, he did not lie idle: he wrote his remarkable analysis of the "Origin of Species," one of the most popular, and surely the most attractive ever penned. Two great talents were thus destroyed precisely as they were reaching their full growth. Tchernyshevsky was sent to Siberia, where he was kept for twenty years, in the mines first, and then, for thirteen years, in Viluisk, a hamlet of a few houses situated on the confines of the Arctic region. A petition for release, signed by an International Literary Congress, produced no effect. The Autocrat was so much afraid of the influence Tchernyshevsky might enjoy in Russia, that he permitted him to return from Siberia and to be settled at Astrakhan, only when he had no more to fear from his noble pen: when the writer was a ruin after a twenty years' life of privation and sufferings among semi-savages. There was a simulacrum of judgment passed upon Tchernyshevsky: his writings, all of which had passed through the hands of the Censorship, his novel written in the fortress, were brought forward as so many proofs of guilt before the Senate. Pissareff was not even brought before a court: he was merely kept in the fortress until reported harmless . . . . He was drowned a few months after his release. In the years 1870 and 1871 a great number of young men and women were kept in the Courtine in connection with the circles of Netchaieff--the first which dared to say: "Be the people! " and induced the youth of Russia to go and spread Socialism whilst living the life of the people itself. But soon, that is, in 1873, a new, wider and safer prison--the Trubetskoi bastion--was opened within the fortress; and since that time the Courtine of Catherine has become a military prison for St. Petersburg officers condemned to "detention in fortresses" for breaches of discipline. Its wide and lofty casemates have been rebuilt, decorated and rendered more or less comfortable. Being in connection with the Trubetskoi bastion, where political prisoners are kept whilst awaiting trial, it is there that a few of them are indulged by an occasional interview with kinsfolk. Special Commissions nominated for preliminary inquiries into State affairs, sometimes have their sittings in the same Courtine, extorting information from the prisoners which may guide them in their researches. Political prisoners are no longer lodged there, and Solovioff, who was hanged in 1879, seems to have been the last "political" in the Courtine. Some inmates of the Trubetskoi bastion are, however, still occasionally taken there for a few days, in order to be secluded from their comrades for some unknown purpose. One instance in point within my knowledge, is that of Saburoff. He was secluded in the Courtine, to be stupefied by drugs, that he might be photographed .... So he was told, at least, when he returned to consciousness. At any rate, the Courtine of Catherine is no longer a prison for "politicals." The Trubetskoi bastion, close by, was rebuilt for that purpose in 1872, and began to receive inmates from the end of 1873. There, the "politicals" are kept now for two, three years, awaiting the decisions of secret Commissions which may send them before a court, or despatch them to Siberia without ever bringing them before any judge. The Trubetskoi bastion, where I spent more than two years, is no longer enveloped in the mystery which clothed it in 1873, when it was first made use of as a House of Preliminary Detention for political prisoners. The seventy-two cells where the prisoners are kept occupy the two stories of the reduct--a pentagonal building with a yard within, one of the five faces of which is occupied by the apartment of the governor of the bastion and the guardroom for the military post. These cells are large enough, each of them being a vaulted casemate, destined to shelter a big fortress gun. They measure eleven paces (about twenty-five feet) on the diagonal, and so I could regularly walk every day seven versts (about five miles) in my cell, until my forces were broken by the long imprisonment. There is not much light in them. The window, which is an embrasure, is nearly of the same size as the windows in other prisons. But the cells occupy the interior enclosure of the bastion (that is, the reduct), and the high wall of the bastion faces the windows of the cells at a distance of fifteen to twenty feet. Besides, the walls of the reduct, which have to resist shells, are nearly five feet thick, and the light is intercepted by a double frame with small apertures, and by an iron grate. Finally, everybody knows that the St. Petersburg sky is anything but bright. Dark they are; (2) still, it was in such a cell--the lightest of the whole building--that I wrote my two volumes on the Glacial Period, and, taking advantage of brighter summer days, I prepared there the maps that accompany the work and made drawings. The lower story is very dark, even in summer. The outer wall intercepts all the light, and I remember that even during bright days writing was very difficult. In fact, it was possible only when the sun's rays were reflected by the upper part of both walls. All the northern face of the reduct is very dark in both stories. The floor of the cells is covered with a painted felt, and the walls are double, so to say; that is, they are covered also with felt, and, at a distance of five inches from the wall, there is an iron-wire net, covered with rough linen and with yellow painted paper. This arrangement is made to prevent the prisoners from speaking with one another by means of taps on the wall. The silence in these felt-covered cells is that of a grave. I know cells in other prisons. Outer life and the life of the prison reach one by thousands of sounds and words exchanged here and there. Although in a cell, one still feels oneself a part of the world. The fortress is a grave. You never hear a sound, excepting that of a sentry continually creeping like a hunter from one door to another, to look through the "Judas" into the cells. You are never alone, as an eye is continually kept upon you, and still you are always alone. If you address a word to the warder who brings you your dress for walking in the yard, if you ask him what is the weather, he never answers. The only human being with whom I exchanged a few words every morning was the Colonel who came to write down what I had to buy--tobacco or paper. But he never dared to enter into any conversation, as he himself was always watched by some of the warders. The absolute silence is interrupted only by the bells of the clock, which play each quarter of an hour a Gospodi pomilui, each hour the canticle Kol slaven nash Gospod v Sionye, and each twelve hours God save the Tsar in addition to all this. The cacophony of the discordant bells is horrible during rapid changes of temperature, and I do not wonder tbat nervous persons consider these bells as one of the plagues of the fortress. The cells are heated from the corridor outside by means of large stoves, and the temperature is kept exceedingly high, in order to prevent moisture from appearing on the walls. To keep up such a temperature, the stoves are very soon shut, whilst the coal is still blazing, so that tbe prisoner is usually asphyxiated with oxide of carbon. Like all Russians, I was accustomed to keep a high temperature, of 61 ° to 64 ° Fahrenheit, in my room. But I could not support the high temperature of the fortress, and still less the asphyxiating gases; and, after a long struggle, I obtained that my stove should not be shut up very hot. I was warned that the walls would be immediately covered with moisture; and, indeed, they soon were dripping in the corners of the vault; even the painted paper of the front wall was as wet as if water were continually poured on it. But, as there was no other choice than between dripping walls and extenuation by a bath-like temperature, I chose the former, not without some inconvenience for the lungs, and not without acquiring rheumatism. Afterwards I learned that several of my friends who were kept in the same bastion expressed the firm conviction that some mephitic gas was sent into their cells. This rumour is widely spread, and has also reached foreigners at St. Petersburg; and it is the more remarkable as nobody has expressed the suspicion of having been poisoned otherwise; for instance, by means of the food. I think that what I have just said explains the origin of the rumour; in order to keep the stoves very hot for twenty-four hours, they are shut up very soon, and so the prisoners are asphyxiated every day, to some extent, by oxide of carbon. Such was, at least, my explanation of the suffocation which I experienced nearly every day, followed by complete prostration and debility. I did not notice it again after I had finally succeeded in preventing the hot-air conduct to my cell from being opened at all. The food, when General Korsakoff was Commandant of the fortress, was good; not very substantial, but very well cooked; afterwards it became much worse. No provisions from without are allowed, not even fruits--nothing but the calatchi (white bread) which compassionate merchants distribute in the prisons at Christmas and Easter--an old Russian custom existing until now. Our kinsfolk could bring us only books. Those who had no relatives were compelled to read over and over again the same books from the fortress library, which contains the odd volumes left there by several generations since 1826. As to breathing fresh air, it is obvious that it could not be allowed to a great amount. During the first six months of my confinement I walked half-an-hour or forty minutes every day; but later on, as we were nearly sixty in the bastion, and as there is but one yard for walking, and the dark ness, under the sixtieth degree of latitude, comes at 4 p.m. in the winter, we walked but twenty minutes each two days in the summer, and twenty minutes twice a week during the winter. I must add also that, owing to the heavy white smoke thrown off by the chimney of the mint which overlooks the yard, this walk was completely poisoned during easterly winds. I could not endure on such occasions the continual coughing of the soldiers, exposed throughout the day to breathe these gases, and asked to be brought back to my cell. But all these are mere details, and none of us have complained much about them. We know perfectly well tbat a prison is a prison, and that the Russian Government was never gentle with those who attempted to shake off its iron rule. We know, moreover, that the Trubetskoi bastion is a palace--a true palace--in comparison with those prisons where a hundred thousand of our people are locked up every year, and submitted to the treatment I have described in the foregoing pages. In short, the material conditions of detention in the Trubetskoi bastion are not ecceedingly bad, although very hard, in any case. But half of the prisoners kept there have been arrested on a simple denunciation of a spy, or as acquaintances of revolutionists; and half of them, after having been kept for two or three years, will not even be brought before a court; or, if brought, will be acquitted--as was the case in the trial of the hundred and ninety-three--and thereupon sent to Siberia or to some hamlet on the shores ofthe Arctic Ocean, by a simple order of the administration. The inquiry is pursued in secrecy, and nobody knows how long it will last; which law will be applied (the common or the martial); what will be the fate of the prisoner;--he may be acquitted, but also he may be hung. No counsel is allowed during the inquiry; no conversation nor correspondence with relatives about the circumstances which led to the arrest. During all this exceedingly long time, no occupation is allowed to prisoners. Pen, ink, and lead-pencils are strictly prohibited in the bastion; only a slate is allowed; and when the Council of the Geographical Society asked for me the permission to finish a scientific work, it had to obtain it from the Emperor himself. As to working-men and peasants, who cannot read throughout the day, to keep them for years without any occupation is merely to bring them to despair. Therefore the great proportion of cases of insanity. In all West-European prisons it is considered that two or three years of cellular confinement is too much, and there is great danger of becoming insane. But in Europe the convict does some manual work in his cell; not Only can he read and write, but he receives all necessary implements for carrying on some trade. He is not reduced to live exclusively on the activity of his own imagination; the body, the muscles, are also occupied. And yet competent persons are compelled, by painful experience, to consider two or three years of cellular confinement as too dangerous. In the Trubetskoi bastion the only occupation allowed is reading; and even this occupation is refused to convicts who are kept in another part of the fortress. The few liberties given now as to the visits of relatives have been acquired only after a hard struggle. Formerly, the visit of a relation was considered as a great favour, and not as a right. It happened to me once, after the arrest of my brother, to see none of my kinsfolk for three months. I knew that my brother, to whom I was more closely bound than is usually the case between two brothers, was arrested: a letter of a few lines announced to me that for everything concerning the publication of my work I must address myself to another person, and I guessed the cause. But during three months I did not know why he was arrested; of what he was accused; what would be his fate. And I certainly wish nobody in the world to have such a three months in his life as these three which I passed without having any news from the outer world. When I was allowed to see my sister, she was severely admonished that if she said to me anything about my brother, she would be never allowed to see me again. As to my comrades, very many saw nobody during all the two or three years of their detention. Many had no near relations in St. Petersburg, and friends were not admitted; others had kinsfolk, but these last were suspected of having themselves acquaintances with Socialist or Liberal circles, and that was sufficient to deny them the favour of seeing their arrested brother or sister. In 1879 and 1880 the visits of relatives were allowed each fortnight. But it ought to be mentioned how an extension of the right was acquired. It was won, so to say, by fight; that is, by the famous famine strike, during which a number of prisoners in the Trubetskoi bastion refused to take any food for five or six days, and resisted by force all attempts to feed them by means of injections and the blows of the warders by which this operation was accompanied. Of late, these rights have been again taken away; the visits are very scarce, and iron-rule has been re-introduced again. The worst is, however, the manner in which secret inquiries are conducted,--the most shameful proceedings being resorted to, in order to extort some uncautious avowal from those who have shown a nervous temper. My friend Stepniak has given several instances of such treatment, and the various issues of the Will of the People contain many others. Nothing--not even the feeling of a mother--is respected. If a mother has a new-born child--a little creature born in the darkness of a casemate--the baby will be taken away from her, and retained as long as the mother refuses to be "more sincere," that is, refuses to betray her friends. She must refuse food for several days, or attempt suicide, to have her baby back....When such horrible deeds can be perpetrated, what is the use of speaking of minor tortures? And still, the worst is reserved for those who are abroad at liberty--for those who are guilty of loving their imprisoned daughter, their brother, or their sister! The basest kinds of intimidation--the most refined and cruel--are used with regard to them by the hirelings of the Autocracy, and I must confess that the educated procureurs in the service of the State Police used to be much worse in this matter than the officers of the gendarmerie or of the Third Section. Of course, attempts at suicide--sometimes by means of a piece of glass taken from a broken window, sometimes by means of matches carefully concealed for whole months, or sometimes by means of strangulation with a towel, are the necessary consequences of such a system. Out of the hundred and ninety-three, nine went mad, eleven attempted suicide. I knew one of them after his release. He has made--he said to me--at least half-a-dozen such attempts: he is now dying in a French hospital. And yet, when I remember the floods of tears shed throughout Russia, in each remotest village, in conoection with our prisons; when I remember the horrors of our ostrogs and central prisons; the salt-works of Ust-kut or the goldmines of Siberia, my pen hesitates to dwell upon the sufferings of a few revolutionists. When I wrote about Russian prisons, I hastened to tell what is the real state of those prisons where thousands of people are groaning every day in the hands of omnipotent wild beasts. I hardly mentioned the state of political prisoners, only alluding to it as far as was necessary to show the development of the struggle that is going on now in Russia. Were it not for the praise bestowed on the Russian Government by its few--very few--admirers, I even should not write at all about political prisons. But, as the facts have been misrepresented, let them be known as they are. There is a much harder fate in store for political prisoners in Russia, than that of the inmates of the Trubetskoi bastion. After the "Trial of the Sixteen" (November, 1880), Europe learned with satisfaction that out of five condemned to death, three had had their sentences commuted by the Tsar. We now know what commutation means. Instead of being sent to Siberia, or to a Central Prison, according to law, they were immured in cells of the Trubetskoi ravelin, in the west of the Petropavlovskaya fortress. (3) These are so dark that candles are burnt in them for twenty-two hours out of the twenty-four. The walls are literally dripping with damp, and "there are pools of water on the floor." " Not only books are disallowed, but everything that might help to occupy the attention. Zubkovsky made geometrical figures with his bread, to repeat geometry; they were immediately taken away, the gaoler saying that hard labour convicts were not permitted to amuse themselves." To render solitary confinement still more insupportable, a gendarme and a soldier are stationed within the cells. The gendarme is continually on the watch, and if the prisoner looks at anything or at any point, he goes to see what has attracted his attention. The horrors of solitary confinement are thus aggravated tenfold. The quietest prisoner soon begins to hate the spies set over him, and is moved to frenzy. The slightest disobedience is punished by blows and black holes. All who were subjected to this régime fell ill in no time. After less than one year of it, Shiryaeff had become consumptive; Okladeky--a robust and vigorous working man, whose remarkable speech to the Court was reproduced by the London papers, had gone mad; Tikhonoff, a strong man likewise, was down with scurvy, and could not sit up in his bed. By a mere commutation of sentence, the three were brought to death's door in a single year. Of the other five condemned to hard labour, and immured in the same fortress, two--Martynovsky and Tsukermann--went mad, and in that state were constantly black-holed, so that Martynovsky at last attempted suicide. Others besides were sent to the same ravelin, and the result was invariably the same: they were brought to the edge of the grave. During the summer of 1883, the Governmeent decided to accord some of them the grace of a hard-labour prison in Siberia. On July 27th (August 8th), 1883, they were brought in cellular waggons to Moscow, and two persons who witnessed their arrival have left a description of it. Voloshenko, covered with scorbutic wounds, could not move. He was brought out of the waggon an a hand-barrow. Pribyleff and Fomin fainted when they were carried into the open air. Paul Orloff, also broken down by scurvy, hardly could walk. "He is all curved, and one leg is quite turned," says the witness. "Tatiana Lebedeva had been condemned to twenty years' hard labour. But she surely will not live so long. Scurvy has destroyed all her gums; the jaws are visible beneath; besides, she is in an advanced stage of consumption.... Next came Yakimova with her eighteen months' old baby: every minute it seemed that the baby would die in her arms. As to herself, she did not suffer much, neither physically nor morally. As usual, she was quite calm, notwithstanding her condemnation to hard labour for life. The remainder were strong enough to walk by themselves from one waggon to another.... As to Mirsky, the four years' sojourn in the fortress has left no traces on him; he only has reached his maturity." (4) True that he was then only twenty-three years old. But--how many of those tried at the same time were missing! How many have been buried in the Trubetskoi ravelin? Since direct communication has been interrupted, nothing has transpired of what is happening in the ravelin; and the worst rumours--rumours of a most abominable outrage--circulate at St. Petersburg as to the conditions which brought about the death of Ludmila Terentieva. Of course, the above question remained unanswered. But, since that time the Russian Government has itself avowed the existence of oubliettes in the fortress, leaving it to its English supporters to explain the contradiction as they like. It has condemned soldiers for carrying letters from these very same oubliettes of the Alexis ravelin! In 1882, eighteen soldiers who used to keep guard in the Alexis ravelin were committed for trial before a Court-martial, together with a medical student, Dubrovin. (6) The soldiers were accused of having carried secret correspondence between thre persons detained in the ravelin and the student Dubrovin. The act of accusation, signed by the military procureur, Colonel Masloff, has been published in fu11, (7) and the condemnations have been announced in the St. Petersburg press. It appears from the official document brought before the Court-martial, that there were, in 1881, four persons detained in the ravelin. They are not named; the procureur designates them under the names of prisoners occupying the cells No. 1, No. 5, No. 6, and No. 13. Until November, 1879--the accusation states--there were only two state prisoners in the ravelin--in cell No. 5 and in cell No. 6. In November a third prisoner was brought and confined in cell No. 1, and next year (November 19th, 1880), a fourth, who was confined in cell No. 13. This last--it appears from the same document--was Shiryaeff. The soldiers had conversations "of criminal intent" with prisoner No. 5; they carried letters between prisoners Nos. 1, 5, and 13, and since the arrival of this last, they began to carry out letters from the ravelin to the student Dubrovin, and smuggled in, on return, periodical publications, letters, and money, which they remitted to the three prisoners." The "conversations of criminal intent" which the soldiers carried on with prisoner No. 5 are related in the accusation exactly as the soldiers described them during the inquiry; and it appears that they had accurately committed them to memory. "There will be a time--No. 5 said--when the peasants will be no longer so oppressed as they are now. The Tsars will govern no more; but instead of then there will be responsible representatives. If the Tsar be good, he may be kept; if not--another will be elected in his place," and so on. No. 5--we know now--was nobody else but Netchaieff. When publishing this most remarkable document, the Will of the People published also some of the letters received by the Executive Committee from Netchaieff. It is, therefore, no secret that, although the Imperial Government when demanding the extradition of Netchaieff had given the formal assurance to the Swiss Republic that he would be treated as a common-law convict, the assurance was a lie. Netchaieff never was treated as a common-law convict. The Moscow Court condemned him to hard-labour, not to detention in the fortress. But he was not sent either to Siberia, or to any hard-labour prison. Immediately after the condemnation he was simply immured in the Alexis ravelin, and has remained there since 1874. The official document of accusation directly calls him a state prisoner "gosudarstvennyi prestupnik." What was the fate of Netchaieff in the ravelin?--It became known that the Government twice made him the proposal "to tell everything,"--once through the medium of Count Levashoff, and another time through General Potapoff. He refused indignantly. The proposal of Potapoff was made in such terms that Netchaieff answered the great Satrap of Alexander II. by a blow in the face. He was dreadfully beaten for that, chained hand and foot, and riveted to the wall of his casemate. By the end of 1881, he had written in his own blood with his nail, a letter to Alexander III.--a most modest letter--merely stating the facts of his imprisonment, and asking the Emperor whether his terrible fate was known by the Monarch and prescribed by his own will? This letter, a copy of which was communicated by Netchaieff to the Executive Committee, and which was printed later on in the Will of the People, was entrusted by the captive to some of those persons who walked under his window when repairs were made in the ravelin--the commander of the fortress never comiog to see Netchaieff, and he being sure that the governor of the ravelin never would deliver the letter to his superiors. Since the summer of 1880, no direct news has been received from Netchaieff. A rumour only was afloat that in December, 1882, he lost his temper with the governor of the ravelin, and was dreadfully beaten--"may be flogged,"--and that a few days later he committed suicide, or died. The only thing certain was that on December 5th, or 8th (old style), one of the captives detained in the ravelin died. The Executive Committee considered Netchaieff as dead, and published by the end of 1883 extracts from his letters. But he may be still alive. As to Shiryaeff, he died on September 28th, 1881. When the captives were deprived of the short walk, formerly allowed; when their windows were shut up with planks (after Netchaieff's letter), and even the hot-air openings of the stoves were shut up, consumption rapidly developed in the poor young man. Netchaieff wrote that he died in a strange state of excitement, and supposed that his death had been accelerated by some exciting drug, in order to obtain avowals.--Why not? They gave drugs to Saburoff to send him to sleep--"in order to photograph him" they said. But, are we sure--is Saburoff himself sure--that what they gave him contained nothing but chloroform or laudanum? Those who so carefully conceal their deeds must do something they dare not to avow publicly. But--who are tho prisoners No. 1 and No. 6? No. 1 must be a Terrorist. As to No. 6, who did not exchange letters with the three others, he is known now through Netchaieff's letters. He is Shevitch, an officer of the Military Academy, reduced to madness, whose insane talk and shrieks are heard in the night by those who pass by the walls of the ravelin. What is his crime? He never was tried in any political trial. He did not belong to any revolutionary organization; he is unknown to revolutionists. What is his crime? The Will of the People says that Netchaieff wrote that once, during a military parade, Shevitch left the ranks, addressed Alexander II. in a rough language, reproaching him for his conduct with regard to Shevitch's sister. Is it so? Or, has he committed some other crime to call down upon himself so base a revenge from Alexander II. as to immure him for ever in a cell of the ravelin?--I do not know. But Shevitch's story must be known in St. Petersburg, and surely it will transpire some time. One thing is, however, certain: Shevitch was not a political offender, he has not been mixed up with any political affair since 1866. He has been brought to madness in the oubliette of the Alexis ravelin for some other offence. Are the oubliettes of the Alexis ravelin the only ones in Russia?--Surely not. Who knows how many like oubliettes there are in other fortresses? At any rate we know now - it has been openly avowed--that there are other oubliettes in the Empire, namely at the Solovetsky monastery, situated on an island of the White Sea. Is Pushkin the sole person who has been so tortured? I do not think so. Some fifteen years ago a Gennan geologist, a friend of mine, discovered an artillery officer in the same condition as Pushkin. We made all kinds of applications at St. Petersburg to influential persons, in order to obtain his release. A Grand Duchess was interested in the fate of this ex-officer. We obtained nothing, and probably he is still in an oubliette, if the prison has not been his grave. A strange fate, however, has attached itself of late to the oubliettes of the Russian Government. In times past, when somebody had entered the vaulted archway of the fortress in company with two gendarmes, he disappeared. Ten, twenty years would pass before anything was heard of him, except such news as circulated in great secrecy among a few kinsfolk. As to those who had the misfortune of being sent to the Alexis ravelin, the Autocrats were sure that nothing would ever oose through its walls as to their fate. Things have changed now; and the change is perhaps one of the best illustrations of how the prestige of Autocracy fades away. As the numbers of foes of the existing régime grew, people were sent to the fortress in such great numbers that it became materially impossible to bury them alive there, like their predecessors. Autocracy itself was compelled to make concessions to public opinion, and found it impossible to execute, or to transport for ever to Siberia all those who had been imprisoned in the fortress. Some of them, at least, were transported to "less remote parts of the Empire"--the peninsula of Kola, for instance--and thence they managed to escape. One of these has told in the European press the story of his imprisonment. (9) Moreover, the fortress itself ceased to keep it secret. The suite of cells in the Trubetskoi bastion had been built in 1873. I was among the first who inaugurated its occupation early in 1874. Then, the bastion was a grave. Nothing but rigorously supervised letters could be brought out of it. There were only six of us occupying thirty-six cells in the upper story, and four or five empty cells separated us from each other. Five soldiers mounted guard in the corridor, so that nearly each one of us had a soldier at his door, and each soldier was closely watched by freshly nominated subalterns, who kept an eye upon the soldiers with all the zeal of novices. No communication whatever was possible between us; still less with the outer world. The system was just introduced, and worked admirably: mutual spying was as perfect as in a Jesuit monastery. But two years had hardly elapsed, before the system disintegrated. In some unknown ways, the revolutionists were found informed about what was going on in the Trubetskoi bastion. The fortress kept no more secrets. The severest measures were taken with regard to the few interviews granted. By the end of 1875, we were prevented from approaching our kinsfolk who came to see us: the colonel in command of the bastion, and a gendarme officer placed between us. Later on, I was told that iron-gratings and other "last words of civilization" were introduced. But it was all useless, and my friend Stepniak says that piles of clandestine letters have been received since from the bastion. A new suite of cells which had received no inmates for many years, was opened then,--the ispylatelnyia kamery of the Trubetskoi ravelin. There--the Government supposed--its enemies might be buried alive, and nobody would learn their fate. But letters managed to penetrate the thick walls of the ravelin: they were published. One of the most secure parts of the fortress thus yielded its secrets. And later on, some of those who had been imprisoned there, finally saw the daylight. It is most probable that the first idea of the Government was to keep them immured in the ravelin throughout the twelve or twenty years they were condemned to--perhaps for life. But again, so many people were sent to the terrible ravelin, and there they died, or wents mad, so rapidly, that the original scheme was abandoned,and after having been brought to the edge of the grave, some of them were sent to Siberia. But there were still in the fortress a series of oubliettes which had remained sealed, whence no news of any kind had ever transpired since they were erected. I speak, of course, of the Alexis ravelin,--the State prison par excellence,--the mute witness of so many abominations. Everybody at St. Petersburg knows this terrible name. It was considered as the safest burial-place, and only two men were kept there. But, we have seen that as soon as they were four, instead of two, the ravelin, too, began to betray its secrets. The soldiers who kept the guard in the ravelin were condemned. But--who would swear that new soldiers nominated in their place would not also carry letters from the ravelin? Then, the Government of Alexander III. reverted to another tradition of the reign of Paul I. Paul I. 's pa]ace at Gatchina, with its secret doors, traps, concealed flights of steps leading up to watch-towers and down to subterranean corridors, had once more become the favourite residence of the Emperor. Why, then, not revert also to Paul I. 's favourite prison at Schlüsselburg? It is forty miles distant from St. Petersburg, at the head of the Neva, where it issues from Lake Ladoga--a bare fortress on a lonely island. It is surrounded but by a small and desolate town, all the inhabitants of which can be easily watched, and years may pass before the revolutionists find a way to force the fortress and to penetrate with their propaganda into the place. So we learned that the Russian Government--so poor that it cannot spare some odd ten thousand roubles for the repair of the foul and dilapidated prisons of Kara--has spent a hundred and fifty thousand roubles in arranging a new State prison at Schlüsselburg, and that the most energetic revolutionists condemned to hard-labour will be sent there. The new prison ought to be a palace; but certainly the money has been spent less in accom modations for prisoners than in arrangements for closely watching them, and preventing any communication with the outer world. (1) For those who are unacquainted with fortress terminology the following explanations may be useful. Each fortress has the shape of a polygon. At the protruding angles are bastions, that is, pentagonal spaces enclosed between two long and two short walls, and having sometimes a second interior building - the reduct -this last being a two- storied pentagonal suite of vaulted casemates, intended for the defence of the bastion when its outer wall is already damaged. Each two bastions are connected by a courtine. The courtine and the two interior angles of the bastions being the weakest parts of the fortifications, they are often masked by a triangular fortification made outside the fortress proper (but enclosed within the same glacis) - the ravelin. 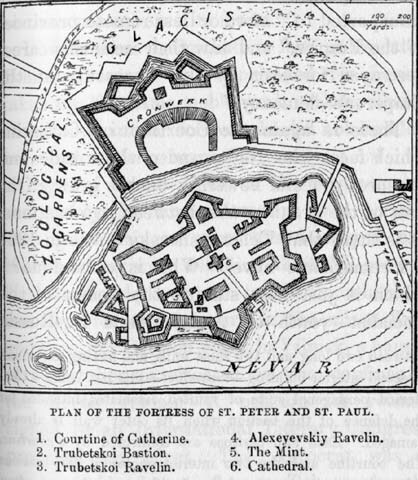 The St. Petersburg fortress has but two ravelins; the Trubetskoi in the west, and the Alexeievskiy in the east. (2) The cells in common prisons - those, for instance, of the prison of Lyons, in France - although having windows of the same size, cannot be compared for brightness with those of the fortress. (3) The authentic record of their imprisonment was published in the WilI of the People, and reproduced in the publication N'a Rodinye ("At Home"). (4)Vyestnik Narodnoi Voli, No. 3, 1884, p. 180. Stepniak's "Russia under the Tsars," ch. xix. (5) Nineteenth Century, June, 1883. (6) Their names and the condemnnations are given in Appendix. (7) Vyestnik Narodnoi Voli, vol. i., November, 1883. (8) Let those who will not fail to express "a doubt" about this story, read M. Prougavin's paper in the November number of the Panslavist review Rusakaya Mysl for 1881, his papers in the Golos of the same epoch, the Moscow Telegraph of November 15, 1881, and so on. (9) Pavlovsky, in a series of articles published by the Paris Temps, with a preface of Turgueneff. (10) Reprinted from the Nineteenth Century, by permission.